A traditional look from the Regency Hill brand, perfect for helping to illuminate seating areas or dark room corners. Ideal for general room illumination, this torchiere floor lamp features traditional styling with subtle details like a swirl font. Amber glass up top creates warm lighting. Comes in a painted restoration bronze finish. 70" high x 11 1/2" wide base x 13" wide glass. Takes one maximum 150 watt or equivalent bulb (not included); on-off column switch. Traditional torchiere floor lamp with amber glass, by Regency Hill. Hand-applied restoration black bronze finish. Cast resin construction and metal construction. Style and function. For ambiance and mood lighting. And for up to 150 watt equivalent capacity. Quality. Elegant looks. Good reviews. Reasonable price. Will go well with existing bedroom decor. Have bought Seattle Lighting lamps in the past with complete satisfaction. The style fits with the room and the price is right. I like the free return policy in case it does not work out. one of the few outlets that had exactly what we were looking for at a reasonable price. To match one I purchased previously. Needed skinny floor lamps to brighten room corners that doesn't take up too much space. 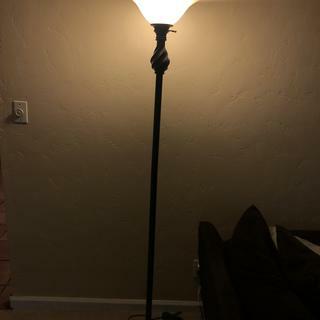 Is the base and pole of this lamp more black or bronze? BEST ANSWER: The base and pole are more black than bronze. It is a nice looking lamp. I think it’s bronze in color. is this a three way switch floor lamp? BEST ANSWER: Hi - This features an on/off switch located toward the top of the glass shade. What type of bulb does this use? A standard base, or "tube" style halogen? BEST ANSWER: Hi - This uses one maximum 150 watt or equivalent bulb. I have added some bulb options below you may use. We just have an energy saving bulb in it. I think you can use whatever bulb you would like to get the effect you want. Thanks everyone, but I got two completely conflicting answers. Back to square one. Is this a battery lamp? BEST ANSWER: No, it has a cord that you plug into the wall. It is a very nice lamp, with good weight so that it is stable on carpet or a hardwood floor. No, it's not. And I love the look of this lamp. It's sleek and elegant and works well. I recommend buying it! I am looking for a replacement glass for the BRONZE TORCHIERE FLOOR LAMP. Do you sell that? Thank you. What is the fitter dimension on the shade? BEST ANSWER: Hi - this doesn't have a traditional shade fitter. The amber glass fits into the base pole and is held in place with a couple of screws. The glass is 13" wide at the top. I wrongly assumed this would be a 3 way light switch. Can the socket be changed to a 3 way easy enough? The lamp is in a corner amidst other things and a floor dimmer is not practical. BEST ANSWER: I'm sorry, you would need to consult a professional electrician to see if the socket could be converted. I can offer another solution. We have a product that will turn the light on and off as well as dim using a remote control. Click on image below for more details. Thanks. I actually ended up replacing the socket myself. It was easier than I thought. But thanks/ I may get one of these anyway! Paint finish was already peeling off on the base of the lamp when I removed it from the box. If you look at the picture where this lamp is standing next to a chair, you'll notice the table lamp is a brown oil-rubbed bronze, and this lamp matches the black of the chair. If you're looking for something browner, this lamp isn't for you. There are a few rings of bronze high-lighting at the base and crown, but the rest of it is glossy black with just a hint of bronze if it's in full daylight. 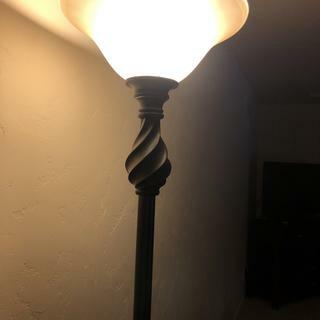 We kept it because the swirl detail at the top is elegant and overall, it's a much nicer looking looking lamp than anything else in its price range (especially on sale). Cons: Darker than most oil-rubbed bronze finishes. My previous lamp looked pretty but turned out to be cheaply made (about the same price). I was fearful this purchase might turn out the same due to the relatively low price but decided to try it anyway. I was pleasantly surprised the product is extremely well-made and I expect it to last for a long time. First-time purchase on the internet. I use this lamp to softly light the whole room while we watch TV. So impressed a budget torchiere has a 3 way light switch with an on/off on the column near the shade AND the on/off/dimmer switch on the nice long floor cord. The shade is pale amber, pale enough so as to allow reading tho a bit glarey as someone else said, Many amber or tiffany style torchieres are so dark amber that they disallow reading. More budget torchieres are just on/off either on the floor or on the lamp. Thanks lamps plus for this. Picked up at the store. Looks great. Fills a need to brifhten a dark corner of the living room. Simple and looks nice, I bought 2 for my living room. It’s a great simple lamp. Very nice lamp! The lamp was packed very well. I had a hard time getting the styrofoam off as it came off in pieces instead of coming out of the box in one piece. The lamp was very easy to assemble and with the bulb I ordered with it it gives me a lot of light. I don’t have to use any other lighting. I am very pleased with this lamp and highly recommend it. I have had a lot of positive remarks about it. It is a very pretty lamp also. Skimped on the glass top - color and size. The light color causes illumination to be glary. Not happy I might have to go back and purchase a different glass top. Also purchased the Swing Arm floor lamp, meant to match. That's very nice. Easy Assembly, and it is 3-way. Cons: Smaller glass top than the height calls for. Absolutely beautiful. Completely satisfied. Tossed some hanging greenery on top and it is gorgeous. Definitely recommend IT. Very sturdy and beautiful lamp. Brightens up the room perfectly! I'm very happy with this lamp. It fits perfectly with my rustic house. Black not Bronze, but Beautiful! This is a well made beautiful lamp. I would've gave 5 stars, but I was a little disappointed that it did just have an on/off switch, no three way. Also, the switch at the bottom of the cord is just another on/off switch, not a dimmer. The finish is definitely black not bronze. Overall if I'd known what I was purchasing, I would give this 5 stars! This tall lamp has a 3 section post that screws together. Top & bottom are quite heavy and sturdy but the post parts are made of very thin metal. So thin that the threads are not deep enough to hold and the lamp post separated when lifted. I repaired it by applying epoxy glue to the threads and then screwing them together again. Seems OK now and looks great. Bad MFG - Couldn't Even Assemble. This lamp was broken right out of the box. I waited 8 days for this lamp to arrive, only to be disappointed. The threading was installed incorrectly so that you can't screw the pieces in all of the way - AND they don't even screw in straight. At least customer service was friendly and issued the return authorization promptly. Don't waste your time purchasing this unless you can purchase one from a storefront and return it immediately if there are any problems. Hi LK G., sorry to hear that you were unable to assemble your lamp in the condition it arrived in. We are glad that you've been assisted with the issue, but should you have any further questions, or concerns, please reach out to our customer service team via phone, email, or chat. Thank you.